"The sooner the better," Miami coach and president Pat Riley said Sunday before the Heat beat the Cleveland Cavaliers 86-81, only their second win in nine games without Wade this season. If Wade chooses the rehab option, he could return to Miami's lineup in about six weeks, or with around 10 regular-season games remaining. He was presented with his recovery options Thursday, one day after suffering the injury in a collision with Houston's Shane Battier, but has not announced a decision. Riley said the team "encouraged" Wade to collect more information. "He's sore. He's all strapped in," said Riley, who spoke with Wade for about 10 minutes by telephone Saturday night. "We had a good conversation." That conversation, though, did not include Riley offering any opinions on which course he wants Wade to take. 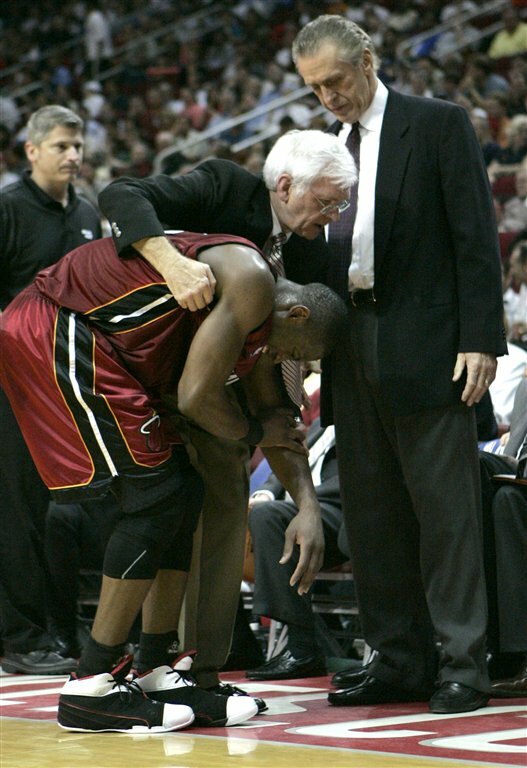 It was the first time Wade and Riley had spoken since the injury; Riley said he FedEx'ed Wade a letter on Thursday because he was having trouble reaching him by telephone. "I asked him why I wasn't in his 'Fave 5,'" Riley said, referring to Wade's sponsorship deal with T-Mobile. "I did, because obviously, I wasn't getting through." Wade entered Sunday as the NBA's fourth-leading scorer, averaging 28.8 points per game, and ranked seventh in the league with 7.9 assists per game. "I know he's disappointed," Riley said. "He wants to play. He wants to be out here. He sees that he's definitely going to be sidelined for a long period of time, even if he doesn't have the surgery. ... It can't be much fun for him, not for a guy who likes to be out on the court every night." LeBron James, who had 29 points for Cleveland in the loss Sunday, said it was "definitely disappointing" for him not to see Wade on the other side of the floor. "Everything happens for a reason," James said. "I told him he has to be patient, let things happen but don't rush it. I had a best friend in high school that had the same injury and he tried to rush it and it kept popping back out. The next thing you know, he was out longer than he was supposed to be." Heat center Shaquille O'Neal, who had 19 points to lead Miami to the win over the Cavaliers, said Sunday he talked to Wade in an effort to lift his spirits. "I was just making sure he was all right, just making sure his spirits are up," O'Neal said. "He's down a little bit. He's going to do what's best for him and his family." Wade has not met with reporters since being injured. He was not expected to travel with the Heat on Sunday night to New York, where the team will play the Knicks on Monday, but may rejoin the club before the reigning NBA champions get to meet President Bush at the White House on Tuesday. "I do believe he wants to go to the White House," Riley said. "I think it's a great honor. You only get one picture like that _ or maybe more. Depends on how many times you win a title. I think he can fly. I just don't know."